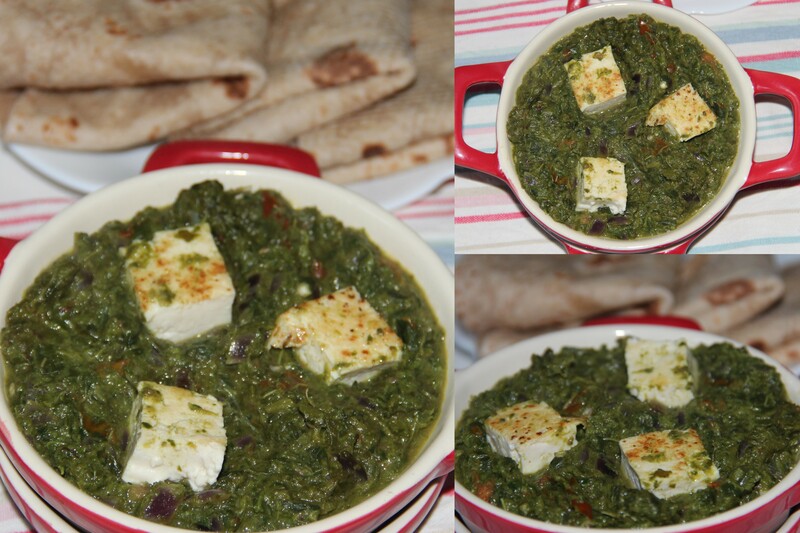 This is a delicious and healthier version of saag paneer that uses tofu rather than cheese. This is wonderful velvety dish with the fresh cubes of tofu. The health benefits of green leafy vegetables are many, and as such they should be an important part of a healthy diet. Greens are packed with vitamins, minerals, and other nutrients that prevent cancer and other diseases. According to the food pyramid guidelines, an average adult needs 3 cups of leafy greens per week. The variety of green leafy vegetables available makes it easy and interesting to include them in our meals. Drain the tofu and set onto paper towel over a flat surface and cover with additional paper towel if require and set a heavy weight on it to drain the remaining water. Allow the tofu to set for 20-30minutes. After 30minutes, remove the tofu from the paper towel and cut into 1/2inch cubes. Heat oil in the medium frying pan add the tofu cubes and saute until golden on all sides. Remove on the paper towl and set aside. Dissolve corn starch/flour with 1/4cup of water and set aside. Cut the stems of greens-wash the green well. Once cooled blend the greens to coarse/smooth along with green chillies. Heat oil in the pan add onion, ginger, garlic and saute for 2-3minutes or until the raw flavour goes off. Add green puree, corn flour-water mixture mix well and boil until the mixture thickens. Add salt, shallow fried tofu mix well and cook on a low flame until heated through. Turn off the flame and sprinkle some lemon juice. Greens and spices can be varied as per the taste. Posted on December 27, 2014, in Indian, Side dish, Vegan and tagged Chitras healthy kitchen, drchdietfood, Vegan indian recipes. Bookmark the permalink. 15 Comments. I love saag paneer and I know I would love this also. I saved the recipe and have everything I need to make it. Can’t wait to try it. Hi Chitra, thanks for visiting my pages and I am glad that you enjoyed them. I am quite interested in Indian cooking with spices, as I love the food. I spent quite some time in South India, eating whatever was going. Loved it. Interesting blog, will follow. thank you. What a great idea to substitute tofu in place of paneer! I have never cooked with mustard leaves but it sounds delicious. Thank you HD. … glad you liked it…you can find them in indian grocery stores by name saag…..